The Hudson Guild Theater, 441 W 26th St.
My Backyard. Cartoon by Thea Hambright. BOTTOM LINE: Concerns about the future of humanity collide in this quasi-absurdist farce. That is the underlying question in Leonard David Goodisman’s new play My Backyard, now playing through February 7th at the Hudson Guild Theater as part of the Venus/Adonis Theater Festival. Spoiler alert: the answer, apparently, is no. Joanie (Desi Waters), a middle-aged widow, just wants to get some sleep. It is the middle of the night when her sleepy suburban backyard is suddenly invaded by a cavalcade of zany characters. There’s Bev (Mikael Short), the scattered, excitable “cat whisperer” on the hunt for a runaway feline; Robert White (Cammerron Baits), the drunken, flamboyant politician parading his achievements in front of anyone who will (or won’t) listen, Dana (Brandon Thane Wilson), the gun-wielding self-appointed DEA agent seeking vigilante justice, and the mysterious Teen (Madelyn Wiley), a stoner fugitive running from an apparent drug bust in the park across town. In Goodisman’s madcap farce, each of these characters seems to represent a different type of inhabitant of the planet Earth. The play, it turns out, is not about these strange characters’ interactions on Joanie’s property, but rather about the perilous fate of humanity if we continue on our present course. Robert White, member of the town library board and self-certified big deal, appears to represent our society’s out of touch leaders, drunk on power and who knows what else. Bev, serial hider and cat-obsessed follower of best friend Joanie, seems to stand in for the animal kingdom, layering a beautiful bed of movement and sound underneath the proceedings but powerless to advance their dramatic action. Dana (who goes by D.E.A.N., or “Drug Enforcement Agency Now”) brings a decidedly military presence to the narrative, taking up arms for all the trigger-happy factions that have engaged each other with regularity throughout the whole of human history. Joanie herself (thanks in large part to Waters’ absolute command of the stage) is the play’s Mother Earth—she just wants everybody to get off her lawn before they go shooting or fracking or rearranging her furniture any further. And the Teen...well, the Teen might as well be the rest of us: the dazed and confused masses who helplessly watch as various destructive forces tear our world apart. It is unclear if Goodisman intended for this close of a reading of his comedic script, but its absurdist overtones and second act discussion of which character may have died in the previous section imply there’s more to this story than meets the eye. Ultimately, no matter how it’s interpreted, My Backyard paints a bleak picture of the future with a very silly brush. And all involved appear to have fun doing it. 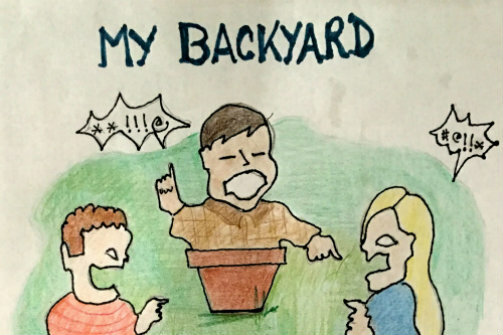 My Backyard is written by Leonard David Goodisman and directed by JC Sullivan. It is produced by The Venus/Adonis Theater Festival. Set construction is by Cammerron Baits and Brandon Thane Wilson. Lighting design is by Cammerron Baits. Music composition is by Mikael Short. Stage manager is Thea Hambright. The cast is Cammerron Baits, Mikael Short, Desi Waters, Madelyn Wiley, and Brandon Thane Wilson.